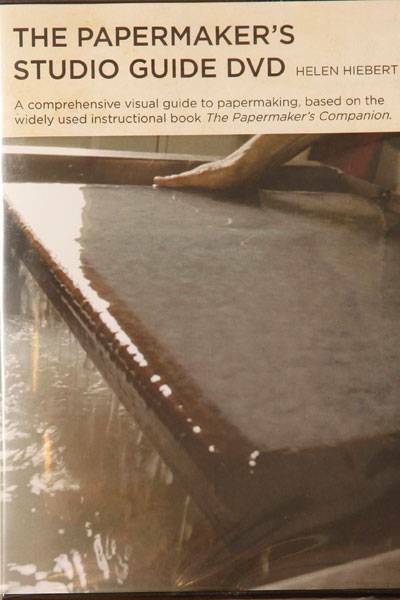 This DVD is a visual guide to hand paper-making based Helen Hiebert’s book, The Papermaker’s Companion. In the DVD you will: • Get tips on setting up a professional papermaking studio. • Discover multiple ways to process pulp. • Explore a variety of sheet forming techniques. • Utilize diverse pressing and drying methods. • Explore unique papermaking techniques such as pulp painting, watermarking, and working sculpturally with paper pulp. • View the work art of over 20 international contemporary paper artists. • Get tips on setting up a professional papermaking studio. • Discover multiple ways to process pulp. • Explore a variety of sheet forming techniques. • Utilize diverse pressing and drying methods. • Explore unique papermaking techniques such as pulp painting, watermarking, and working sculpturally with paper pulp. • View the work art of over 20 international contemporary paper artists.